While Piedmont Woodland cultures were characterized by continuity and gradual internal change, the Woodland Period of the North Carolina mountains was a time of increasing cultural diversity stimulated by ideas from outside the region. Much of what is known about the Early and Middle Woodland periods in the Appalachian Summit is the result of research in eastern Tennessee. Beginning in the 1960s, the University of North Carolina's Cherokee project established the chronological and stylistic markers of the Woodland Period and research by the University of Tennessee at Knoxville filled in details of settlement, subsistence, and overall cultural change and adaptation. Map of the North Carolina mountains showing Woodland and South Appalachian Mississippian sites. Early Woodland ceramics similar to the Piedmont Badin series are found in the Appalachian Summit. The Swannanoa pottery series has thick vessel walls (from 7 mm. to 22 mm.) with cordmarked and fabric-impressed surfaces. Check-stamped, simple stamped, and plain surfaces were added later in the phase. A few steatite vessel sherds suggest continuity with the preceding Late Archaic period. Stylistically, Swannanoa pottery is similar to Kellog ceramics of North Georgia, Watts Bar pottery of eastern Tennessee, and Vinette wares of eastern New York state. 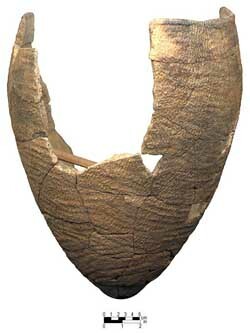 A partially reconstructed Swannanoa Fabric Impressed pot from the Gashes Creek site. 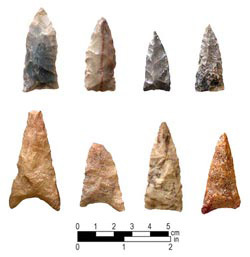 The Swannanoa phase is characterized by small, stemmed projectile points called Swannanoa Stemmed, Plott Stemmed, and Gypsy points. These represent the last gasp of the stemmed-point tradition that began at the close of the Late Archaic period. Like other varieties of Early Woodland stemmed points, the Swannanoa phase points also were found stratigraphically associated with a large triangular point type named "Transylvania Triangular." 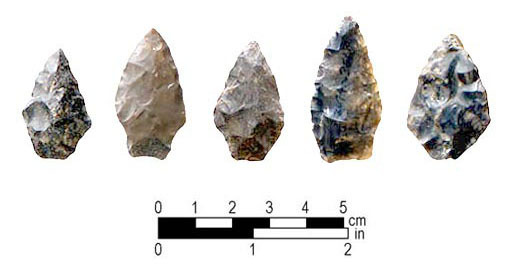 Early Woodland Swannanoa Stemmed projectile points from the Warren Wilson site. Although several kinds of Swannanoa phase features were found at Warren Wilson site, large hearth areas composed of clusters of fire-broken rock were most common. These stand in marked contrast to the relatively small, circular pit hearths of the preceding Late Archaic period. No cultigens or seed plants have yet been found in the small sample of subsistence remains known for Swannanoa phase. Rather, arboreal nut crops show continuity with Archaic economic pursuits. Current evidence suggests that Middle Woodland connections can be seen in areas outside the Appalachian Summit region. Two distinct phases of Middle Woodland occupation have been recognized: the Pigeon and Connestee phases. Early in the Middle Woodland period ceramic connections are seen to the south, where carved wooden paddles were first used to stamp the surfaces of pottery vessels. In spite of a clear developmental relationship with the Pigeon phase, Connestee phase is distinctive. Exotic artifacts show connections with other Middle Woodland groups and indicate participation in the Hopewell interaction network. Later in Connestee phase, southern influences from the Swift Creek area of southern and central Georgia continue to be felt after the Hopewell climax. Middle Woodland pottery reflects a dramatic break with the cordmarked and fabric impressed ceramics of the Swannanoa phase. Vessel forms and surface treatments show continued change throughout the Woodland Period. Evolution of Woodland pot forms in the Appalachian summit region (based on Keel 1976:249,258, 262; Keel and Egloff 1984:15). Large triangular points began during the Swannanoa phase and appear to be associated with the introduction of the bow and arrow. During the Middle Woodland period small sidenotched and triangular projectile points are found. Middle Woodland triangular points from Warren Wilson (bottom row, left two specimens) and Garden Creek Mound No. 2 (top row and bottom row, right two specimens). Cultural dynamics and stylistic markers of the Late Woodland period in the Appalachian Summit region are poorly understood. One excavated site that appears to have been occupied during this time is the Cane Creek site in Mitchell County. Cane Creek site had a remarkably homogenous ceramic assemblage with plain, smoothed, or brushed surfaces, and frequently notched vessel rims. None of the tetrapodal vessel supports of the preceding phases were found. Cane Creek's well-preserved assemblage of bone tools and mortuary pattern are similar to Late Woodland cultures throughout the Southeast between A.D. 800 and 1200. The cultural uniformity of Cane Creek site only heightens the seeming disparity between Woodland cultures and the Mississippian-influenced cultures that appeared abruptly after A.D. 1200. See North Carolina's oldest art.